We will remove and add actions over time, please check back and see what else you can do. We recommend that you bookmark this site on your computer so you can return and continue to take action. Many actions take about two minutes. Have you heard about Cruelty Free International's campaign? You can sign up at www.crueltyfreeinternational.org. It only takes a few seconds and could make a real difference. Over 80% of countries worldwide still allow animal testing for cosmetics products and ingredients. Cruelty Free International is calling on governments around the world to ban animal testing for both products and ingredients. Please support the campaign by adding your voice to the pledge today. Petition to sign against kitten experiments at Cardiff University (Wales)- please sign here. The Madigan Army Medical Center continues to force hard tubes down ferrets' throats for intubation training exercises, despite having publicly announced in 2007 that the use of ferrets "will be phased out due to the development of adequate simulation training models." Please click the link here to ask Madigan officials to honor their earlier pledge by immediately replacing the use of animals for intubation training with simulation training models, which are widely available. Please mention if you are a United or Continental Frequent Flyer customer. You can leave a message on United's Facebook page, Tweet at United Airlines Twitter, or send an email message; or do all three actions here. A distraught whistleblower from Shin Nippon Biomedical Laboratories (SNBL), a notorious Everett, Washington-based animal testing conglomerate, contacted PETA to reveal shocking allegations of mistreatment of animals used in painful and lethal experiments. The whistleblower weighed her concerns for her job and fear of retaliation against the suffering and deaths of animals that she witnessed every day at SNBL and repeatedly appealed to SNBL managers and supervisors to improve conditions for animals in the company's laboratories. After those pleas were ignored, she felt compelled to contact PETA. Take action at the bottom of this page. SAS SCANDINAVIAN AIRLINES FLY LAB ANIMALS! NAVA Has recently discovered SAS to be 1 out of the remaining 2 airlines still transporting lab animals in the UK! Recently exposed Harlan Laboratories are a regular customer to SAS who use the airline to export their animals out of the country on a regular basis! Tell SAS you will be ending your custom until they end the lab animal shipments! immediately cease your participation in such an unethical practice. inquisitive and intelligent animals by discontinuing your participation in the testing business. you, too, make the similar decision. The European parliament recently voted to further weaken already grossly inadequate laws to protect animals being experimented on in EU Labs. This includes a section intended to save research firms money by allowing them to kill surplus or 'spent' animals by a heavy blow. You can now legally smash a lab animal with a hammer or against a wall to kill it anywhere in the EU when it's no longer 'useful'. The new Act also prevents any member states from enacting national legislation to improve lab animal welfare. This it has been claimed is to make countries "equally competitive to business". 2) Also please sign this petition demanding the UK Govt. stand up to the EU for once and refuse to implement this edict. Adverse drug reactions have reached epidemic proportions, sending a million Britons to hospital and killing more than 10,000 every year. Currently, new medicines are approved for human testing on the basis of animal tests, as required by the Government. But 9 out of 10 drugs fail in human trials because they are unsafe or ineffective for humans, despite appearing safe and effective in animal tests. All the evidence suggests that new methods based on human biology, which are already commercially available, would improve safety and save lives. The Government must act now to employ the best technologies available to improve the safety of medicines and reduce the tragic toll of adverse drug reactions. Please ask them to do so by signing here. "Save the Harlan Beagles" are currently running a petition and have now over 19 thousand signatures, can you please help the beagles reach the total goal of 30'000 by the time the National march is taking place which is on the 25th August in Cambridge UK, supported by Lush. Please take a minute to ask University of Virginia School of Medicine dean Steven DeKosky, M.D., to replace the use of cats in UVA’s pediatrics residency program with validated human-based training methods. We have provided text for you, but if you decide to write your own message, please be polite and encouraging. Click here. Mazor farm brreds monkeys on a massive scale for export. Monkeys are trapped in the wild to supply Mazor, and exported monkeys are exported all over the world. Pressure is growing on this farm, so please support them by contacting relevent people. You can see more here. OIPA has recently learnt from the Japanese Association JAVA that Kitasato University is performing particular cruel tests on cats during physiology seminars. These tests imply the cats’ skull opening with consequent fixing of electrodes into their brain. Please send a letter of protest to Kitasato University asking them to adopt modern technology on a permanent basis, in order to stop animal testing for ever. Ask Indonesia to ban the capture and trade in wild monkeys. Article here. The BUAV is calling on the Government of Indonesia to end the trade in wild long-tailed macaques. The call comes following shocking secret video footage of monkeys openly for sale at markets and during the capture of hundreds of other wild macaques for a company that exports primates to the international research industry. In addition to the cruel and brutal treatment of these animals, the international and domestic trade of the long-tailed macaque in Indonesia is raising concerns about the survival of the species. Indonesia claims to have a ban on the export of wild-caught primates for research. Yet, the BUAV believes this ban to be a sham. Indonesia has supposedly had primate captive-breeding programmes in operation since 1994, yet 18 years later, large numbers of wild monkeys continue to be trapped by companies exporting primates for research. Furthermore, monkeys living freely on so-called ‘breeding islands’ are incorrectly labeled as born in captivity on export permits. The BUAV believes these animals are wild-caught and should be labeled as such. Please write to the Indonesia Embassy in London (or the Embassy in your country) calling for an end to the suffering and exploitation of the long-tailed macaque in Indonesia. In particular, stating your objection to the recent trapping of wild monkeys and their transportation to a primate supply company and uncertain future. Call for the government to place an immediate ban on the capture, breeding and export of long-tailed and pig-tailed macaques destined for the research industry. Find out the contact details of Indonesian embassies around the world click here. The BUAV has uncovered a new airline involved in the transportation of primates for research. Last year, Brazil’s and Latin America's largest airline,TAM Linhas Aéreas, flew eleven marmoset monkeys from Brazil to the University of Nebraska in the USA. Please contact TAM Linhas Aéreas to urge them to end their involvement in the cruelty and suffering that is intrinsically linked to the trade in primates for research; and to implement a policy as a matter of urgency to stop any future shipments of this type. For more information on the BUAV's Cargo Cruelty campaign and to watch the campaign film. PCRM needs your help. And so do animals sitting in lab cages. The Environmental Protection Agency (EPA) needs to know that testing chemicals on animals is bad for animals, and bad for people. Please sign our petition to EPA Administrator Lisa Jackson right now. Tell her that you oppose the use of animals in chemical testing. 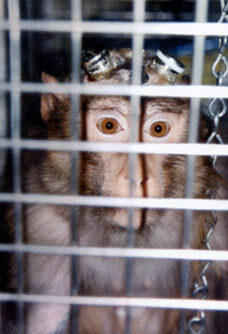 Air China still transports primates to their deaths in laboratories! Please click the link below to ask the company to join other major airlines in refusing to ship animals destined for laboratories.